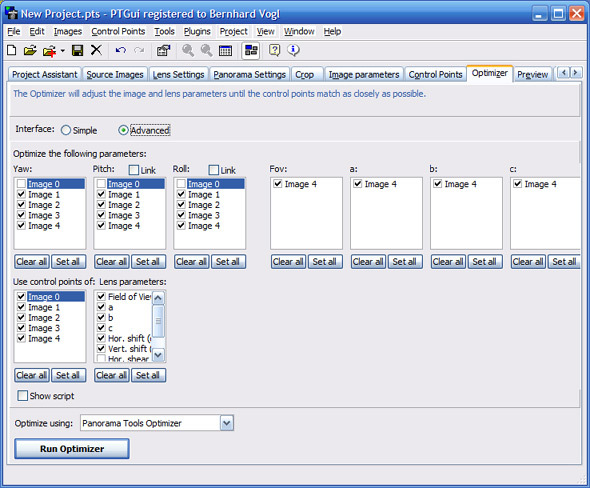 The PTGui Project Assistant has now created some control points for you. We now have to check if the control points are correctly set. 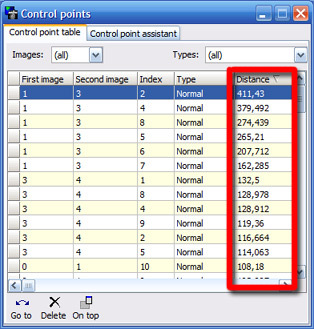 Click on the tab "Control Points" and let both control point windows show the image number 0. This will also tell PTGui that you want to define vertical lines! Click on "Advanced" and unset all checkmarks except "Pitch" and "Roll" for image 0, also "Use control points of Image 0". Click the button "Run Optimizer". After a short time you will see a message box telling you the optimization would be "Too good to be true". To understand the positioning of the control points, I use the comparison of a "lever force": both defined vertical will try to "pull" your image to a position where they are as perpendicular as possible. We will now optimize the rest of the images as well as the "Lens Parameters"
To achieve a mathematical correct optimization, you will need at least one pair of control points for every image pair of your panorama. Also you should not optimize "FOV", "a", "b" and "c" separately. We have 7 checkmarks (Yaw, Pitch, Roll, FOV, a, b, c), so we need at least 7 control points per image pair. Now you have to kind of "invert" your checkmarks. Don't forget: don't move image 0 any more, but you must adapt the rest of the images now. We will do the optimization step by step. So we won't touch the lens parameters now (with a good reason). 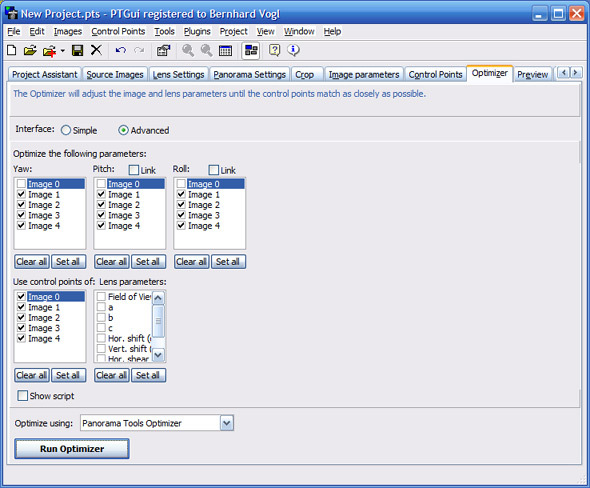 PTGui calculates control points at identifiable structures. In our case we have a lot of architectural elements which look very similar. We have to remove the control points on similar - but not same - structures. They can be found very easily: Go back to "Control Points". Look at images that do not overlap (e.g. image 0 and 2). Delete the control points there. Double-click on the respective line to see the control points in your image. There you can decide if the control point is set correctly or not. Repeat these steps until you think you have found most of the wrong control points. Now you can restart the optimizer and recheck the above table. You may repeat the steps until you are content with the optimization. If you get strange results from the optimizer at a later step - come back here and recheck your control points. Most problems are the result of a wrong control point! Finally you can add the checkmarks for the lens parameters "FOV, a, b and c" and optimize again. Check the result in the "Editor Window" and add some points where the images won't fit nicely. If you took your photos without obeying the nodal point rule, I strongly discourage setting control points in areas with near and far objects. Because of the parallax a good solution will be impossible! A good strategy is setting control points only at objects that are at the same distance from the camera. A minimum size for the preview of 1200x600 is recommended. 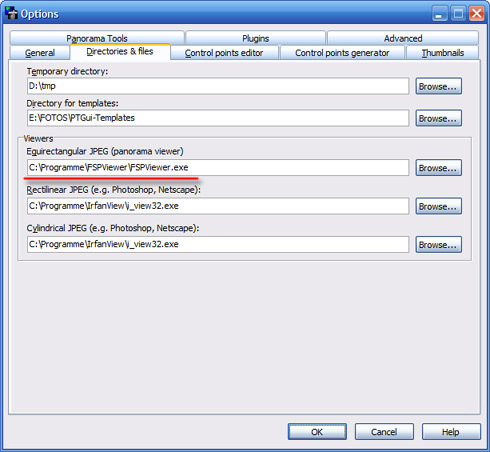 The new "fast transform" option of pano12 and a fast computer will also allow fast previews up to 3000x1500. 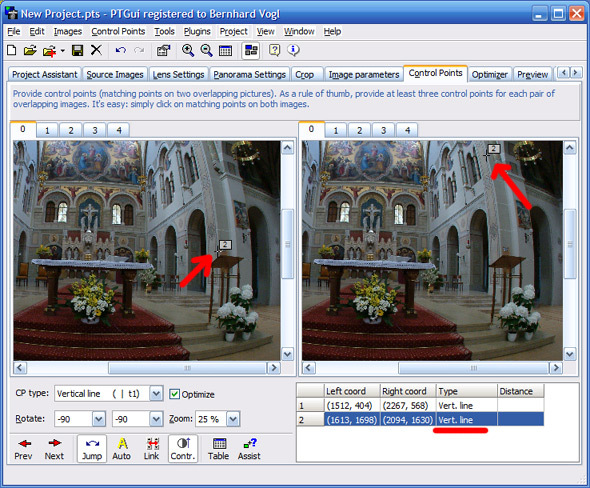 After some calculation time the "Image Properties"-window of PixScreen will appear. 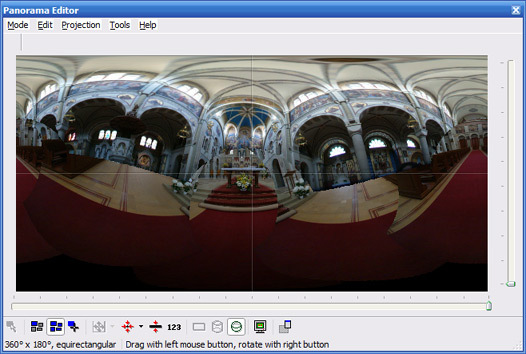 Choose the "Scene Type" Spherical and activate the box "Full Revolution"
You can now judge the final quality of your panorama for the first time. If you are not content, go back to PTGui and try to add/change/delete some control points for a better result. Don't be too anxious about small image errors. We have one tool remaining: Enblend/Smartblend. The only important features in the image are straight lines which at least have to cross themselves when spanning over more than one image. The correct optimization lays the ground for a good panorama. Take some time for this step as it will help you saving a huge amount of time when assembling the images. 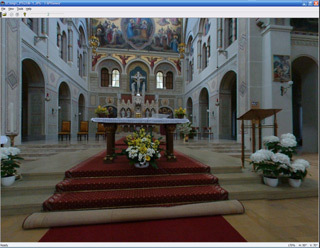 If you don't have a tiltable panorama-rig and you have shot the single images freehand, the Zenith-image may heavily deviate from the rest of the images. 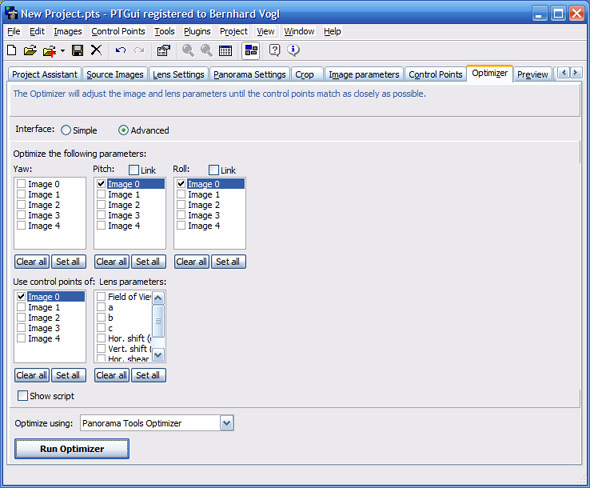 In this case, we may achieve better results by using an advanced function of PTGui: individual lens parameters for a single image.